Russophobia – literally, fear of Russia, but more commonly understood as dislike or hatred of Russia – is not a new phenomenon. Academics have written a number of books about how citizens of various Western countries have viewed Russia over the centuries – Marshall Poe on early modern European perceptions of Russia, James Casteel on Russia in the imagination of Germans, David Fogelsong on Americans’ missionary attitude towards Russia, and so on. But until now the general phenomenon of Russophobia has never been comprehensively analyzed. This gap in the literature, as we academics like to say, has now been filled by Swiss journalist Guy Mettan, with his 2017 book Creating Russophobia: From the Great Religious Schism to Anti-Putin Hysteria. Or at least, partially filled, for while Mettan’s work contains much which is perceptive, it also suffers from certain biases which, I think, will make it more of a starting point for future studies of Russophobia than the definitive, final word on the subject. A former editor-in-chief of the newspaper Tribune de Genève, Mettan is an intelligent and well-informed observer who deserves to be taken seriously. He’s also very much a Russophile, as shown by the fact that he was granted Russian citizenship in the mid-1990s by the administration of President Boris Yeltsin. 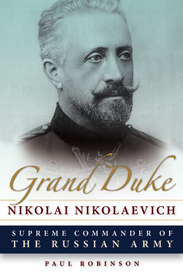 He complains of ‘widespread prejudices, cartloads of clichés and systematic anti-Russian biases of most western media,’ and states that the purpose of his book is ‘convincing readers that there is no need to hate Russia.’ While Creating Russophobia is founded on detailed research into centuries’ worth of Western writings on Russia, it is not, therefore, a neutral academic book, but one with a definite political purpose. Mettan divides his book into three parts. The first provides examples of Russophobia in the modern era, with a particular focus on how the Western media has portrayed events such as the Beslan hostage-taking in 2004, the Russo-Georgian War of 2008, and the Maidan revolution and subsequent war in Ukraine from 2014 onwards. In the process, Mettan exposes widespread anti-Russian bias in the Western media. The second part seeks to explain why this bias exists, by means of historical study, looking at the great schism between the Catholic and Orthodox churches, and the history of Russophobia in France, Great Britain, and the United States. The third part of the book then analyzes the linguistic and other techniques used by Russophobic writers to distort news stories in a manner unfavourable to Russia. Russia upsets the image the West has of itself and of the world. The clash between the West’s idealized vision of itself and its harsh reality as viewed by Russia clarifies the Western psychological need for demonization of Russia. … By ceaselessly renewing and remodeling its anti-Russian discourse, the West enhances and reassures itself, strengthens the high opinion it has of itself achieved by belittling the Other. This fits with what I have previously written on this blog about the ancient Greek concept of hybris – which is to say the habit of belittling others so that your own status rises in comparison. Mettan’s conclusion thus strikes me as a fair one. Part II of Creating Russophobia also contains some interesting material. Mettan’s analysis of French, British, and American Russophobia is quite thorough, and I certainly learnt some new things. Mettan, for instance, describes the French ‘theory of the cultural gradient’, according to which ‘progress’ advances from west to east, gradually civilizing the world in the process. This theory provides an essential framework within which Russia is placed, allowing it to included or excluded from Western civilization according to prevailing needs. I found the chapter on Britain particularly interesting. Mettan places British Russophobia within the context of domestic British party squabbles and reveals some historical incidents of which I was not aware, such as the 1836 Vixen affair, in which the British tried to send arms to Circassian rebels via the schooner Vixen. Mettan’s description of hidden Russophobic messages in Bram Stoker’s novel Dracula was also intriguing, as was his analysis of how Cold War Americans subtly changed their vocabulary when describing the Soviet Union, substituting the word ‘totalitarianism’ for the previous ‘dictatorship’, ‘in order to better distinguish friendly regimes from antipathetic socialist regimes which were to be fought.’ Insights like this make Creating Russophobia worth the read. So too does some of the analysis from Part III. An example is Mettan’s analysis of ‘framing and factual distortion’ in which he notes that ‘one of the great ploys consists in dating the start of events in a way that favors one camp rather than the other.’ The problems in Ukraine are thus generally depicted as starting with the Russian annexation of Crimea, rather than with the violent protests on Maidan. Framing of this sort shapes public opinion in subtle ways which evade most peoples’ understanding. But despite these good points, Creating Russophobia has some serious deficiencies. Most importantly, in his desire to combat Russophobia, Mettan swings far too far in the direction of uncritical Russophilia and harsh anti-Westernism, particularly anti-Americanism. The result is exaggeration, one-sided analysis of complex historical issues, and occasional factual inaccuracies. Mettan begins, for instance, by claiming that ‘critics of Russophobia … have no access to the mainstream media.’ This isn’t true – they undoubtedly have limited access, and are greatly outnumbered in the mainstream media, but they are not entirely absent. Describing the immediate aftermath of the 2014 Maidan revolution in Ukraine, Mettan writes of a ‘promise to give the Sebastopol naval base to NATO’; ‘the massive military aid provided by the Americans to the Ukrainian regime’; and ‘the Kiev provisional government’s decision to forbid the use of the Russian language in the Russian-speaking parts of the country.’ There was no such ‘promise’, military aid has not been ‘massive’, and Kiev never issued an order ‘to forbid the use of the Russian language’ (the Rada merely attempted to repeal a law permitting regions to establish education in Russia, and has subsequently imposed some restrictions on the use of the Russian language – not good, but not the same as forbidding it.) Maidan ‘saw the Kaiser’s old dream materialize,’ Mettan claims, adding that, ‘Germany … has never given up her territorial ambitious on the East nor her will to dominate Europe,’ and with Maidan, ‘Germany has just won the First and Second World Wars.’ In my opinion, this goes far too far. ‘Americans are habituated to converting the schismatic and burning heretics under napalm’, Mettan remarks in reference to the modern era. But, according to Mettan, the West’s guilt stretches far beyond the United States and events today. In his eyes, the responsibility for centuries of poor Russian-West relations belongs entirely to the West. Describing the Great Schism, for instance, Mettan entirely takes the side of the Orthodox church, writing that, ‘the schism … had been entirely provoked by the pretention of Westerners to rule over the temporal as well as the spiritual realms.’ Analyzing the Russophobic writings of early modern European visitors to Russia, Mettan quite rightly makes heavy use of Marshall Poe’s 2000 book A People Born to Slavery: Russia in Early Modern Ethnography 1476-1748, but he ignores Poe’s conclusion. For as I recall the book, Poe concludes that the reason why so many European visitors reported Russia as being despotic was that, by comparison with Western Europe, it was. In short, the visitors weren’t so much Russophobic as accurate. But Mettan ignores the possibility that Russian deficiencies might have played any role in the spread of Russophobia. In fact, he ignores such deficiencies entirely. He complains, for instance, that Westerners downplayed the ‘positive achievements of the Communist regimes’. That may be so, but Westerners weren’t wrong in depicting the Soviet regime as repressive. Anti-communism, and any associated Russophobia, weren’t just fabrications of devious Westerners seeking to expand their own power. There’s a lot which is original and interesting in Creating Russophobia, but ultimately I found it flawed. Its obvious biases mean that it is unlikely to persuade any but those who are already convinced Russophiles or anti-imperialists. And that’s a shame, as there is an important story here to be told. At the end of his book, Guy Mettan notes that, ‘At no time do western political leaders, historians, journalists ask themselves the question: do we bear any responsibility for the crises in the world? … Aren’t there wrongs on both sides?’ These are important questions which ought to be asked more often. Mettan concludes: ‘The discourse must be changes: it must be made to evolve away from long-induced antipathies and move toward negotiation, coexistence, multipolarity, and most importantly: peace.’ I heartily agree. Sorry, but your objections seem like tenuous nitpicking. The pursuit of ‘objectivity’, whether it makes sense or not. If you tried to do the same vis-a-vis certain other phobias (‘on the other hand, those being hated have their own issues that can partially explain the attitude towards them…’), I suspect you could be prosecuted, convicted, and locked up by some non-repressive western regimes. But not in Poland, HRE/Germany and Sweden, from whence the rest of Europe often got their ideas about Russia in the first place? DESOLE. AKA incessant “FSB (Former KGB)” (c), “Former Soviet Union”, and cavalier approach in naming of countries/people with Russia/Russians being used for “bad” cases, and suddenly remembering particular ethnicities/constitute parts of the country (e.g. “Chechen freedom fighters” or “Russia occupied Baltics”). Oh, and hypocritical gnashing of teeth about “tragic and brutal fate of Russia”. Stuff like that? He might be unto something. Those idiots writing crap about Russia ultimately know nothing about Russia – so they write about what they know. They think that they know the most themselves, and so end up projecting the aforementioned “evil Other/Outsider”. 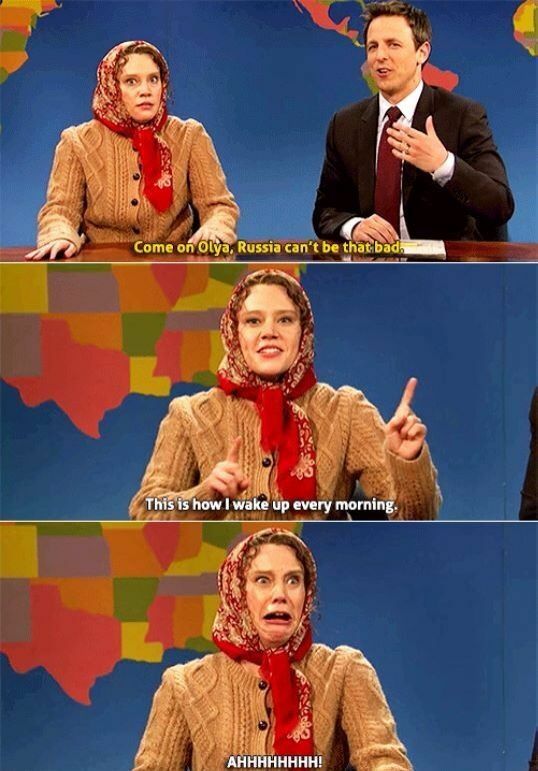 ^SNL – the PARAGON of comedy. Granted – American comedy. It happens right now. Go and check the Free and Independent Western Press ™ coverage of the situation in Azov sea, and you will discover that Russia SUDDENLY decided to start harassing plucky Ukrainian ships for not reason at all. The facts of the Ukrainian piracy escape the Western notices – Russia began this! What’s “despotic” anyway? One can say that English laws against vagrants were despotic – and Russia had not such laws. Or one can compare the instances the respective legal codes resorted to the death penalty of the lost of limb to see who’s really a despotic one. Russian nobility was not as uppity, self-centered and useless as European counterparts, which developed a class conscience and effectively fought for its rights– i.e. to have no duties and only and privileges. That is the definition of “despotism” for any shy lover of freedom – to have duties. It’s called bias and propaganda – when you do not lie outright, but present a one sided view that fits your agenda. For you, Professor, that’s a good thing? Well that’s probably a good reason for it not being THE definitive version. It may well have to do with language difficulties – M. Mettan is French-Swiss, the time and effort to trace the historiography in the HRE would be quite a daunting task alone, let alone Sweden and Poland. In earn’st, do you know of any work on the subject? Btw. as an historical aside, I recently picked up a book, published in Florence in 1943! about the history of Russian political thought (a reasonable primer for an ignorant in such matters as I) : “2 centuries of Russian political thought” by Wolf Giusti, a well-known professor of slavistics.It’s quite a curious little book, striving for balance, so for instance pointing out the utter ahistoricity and lack of foundation of Prov. Gov., ending with an assessment that the URSS had in Stalin’s fusion of Lenin, Marx, and Engels, “nationalised” socialism and had turned away from world revolution, but arguing that this also in large part a pragmatic necessity. Most relevantly to the subject of this blog, it subsequently made me reflect that perhaps the current of Russophilia ought also to be considered and examined, particularly in light of the guiding role played by Russian elements in the history of the 20th century, but also earlier. After all, such currents existed, and continue to exist, even if not always left-political in nature (these days prob not). I hope it would not be too presuming of me to inquire as to your reccommendations of history books (incl. materials on the archives of the Comm. Party) on which to build a basic understanding of the history of Russia and the broader “Russian world” both in English and non? I don’t really know what I can offer in return, or if you indeed would have any use for what I would know, but I do recommend for instance the “popular history of Italy” series (written in partnership with prof. historians but for the ‘masses’ in the 50’s-70’s) and other works of the liberal anti-fascist journalist Montanelli (because of their literary style as much as anything) and the history of the PCI by Spriano if I remember correctly. Dear Prof, a very interesting review, but what was the Author’s ultimate (sozusagen – obviously provisional) conclusion on the interplay between “cultural attitude” and “political necessity” in influencing attitudes to Russia? Or is that an aspect in need of further study? Sadly, I’m not aware of any topical historiography (even if it exists in the first place), but I’m keenly aware of the historical sources. I for one can not imagine any discussion of “Russia through European lenses” without mentioning and putting in the appropriate historical (even “geopolitical” if you like) context of Siegmund, freiherr von Herberstein and his “Rerum Moscoviticarum Commentarii”. His diplomatic activity took place on the backdrop of the twin aftermath of the Florentine Unia of 1439 and the fall of Constantinople in 1453 with the subsequent passionarnost’ expressed by the Ottoman Turks at the expense of Europe. The mere thought, that the chief monarch of the West might treat Russians as humans, riled up freedom loving Poles and Lithuanians, who spared no effort to ameliorate that with their propaganda efforts – e.g. the ludicrous apologia of hetman Tarnivsky’s action during the siege and subsequent massacre of Starodub and its garrison in 1535 – less then a decade after Herberstein’s second visit to Russia. Oh, and how can one not mention while listing the Old-Timey Russophobes the Baltics – at that time held under sway of the Livonian Ordenstadt, made up of the noble downshifters mostly from Rhine-Westphalia. Technically part of the HRE, they together with Sweden were surprisingly successful in lobbying of the pan-empire trade sanctions against Russia (gee, does it remind you anything?) using tired and tested tropes about “tyranny” and “heretical faith enemy of the one true Church” ™. Reading their implorations, HRE’s emperor’s decrees and official reports on the number of “sanctions violators” (it was way too profitable!) is an enlightening read. In all diplomatic/intelligence reports of the late Medieval – early modern era made by the foreigners in Russia there is palatable sense of fear. The numbers are obviously inflated in order to paint the image of the “Horde” ready to sweep aside plucky Polacks and march into the cosy, freedom-lovin’, heretics burnin’ Europe. Swedish reports (1650-55) by Johan de Rodes paint nearly apocalyptic picture, because our “merchant delegation member” took time to look into new fortifications and the amount and quality of the new cannons in his “spare time”. So, to reiterate – read primary sources. Eerie parallels with the here and now are guaranteed. I’m convinced that nearly all self-professed Russophiles are also self-deluded, loving an imaginary construct, or a tiny sliver of what makes up Russia. Because I’ve yet to find a Westerner who’d simultaneously grok Russia and accept it as it is. Hell, finding someone who simply says that Russians are not two-headed ogres is already viewed by some as a criminal Russophilia! I’ve been studying history since I was… 9? I remember how my grandfather read to me, then 6 or 7 years old “Zadonshchina” – and translating it into modern Russia. I’ve consumed since then so much, from so different sources, so it’s really hard for me to say what really makes “Russian history 101”. Contrary to the popular belief – no, reading “3 titans” (i.e. Karamzin, Solovyov, Kluchevski) is not a good start, they are for “advanced” students at least. Given all the turmoil of the past 30 years I can’t even recommend a single textbook, although, I’m naturally biased towards MSU written ones ;). What can I recommend? Do the boring stuff – get to grips with the political history (dates, events, rulers, stuff), then after getting an overall picture to a degree when some “minor” events won’t surprise you (like the abovementioned Starodub War – just how many students of Russia know about it?) you might try to focus on a single period. But even then you can’t understand Russian history without it agrarian history. Obvious choice here – Russian Plowman and Special Aspects of Russian Historical Process by L. Milov. Again – not an easy read. But enLYTTENing. Shaming propacondoms from the Free and Independent Western Press ™, (double)think-tanks, government funded NGOs with the ties to the IC and politicians is like preaching chastity to the whores. The existing economic system makes it profitable, not too tiresome (some actually like it) with zero chance of getting some “bug” or repercussion. Why would they change, especially in our thoroughly amoral world? Given that, among other things, Maidan Kiev recently outlawed non Ukrainian publications (including the pro Maidan Kiev post, zero sympathy from me) you should perhaps update you “what Maidan has actually done” rap sheet. If Russia accuses Maidan of something, chances are it either happened or it will happen since Maidan simply cannot survive without continious confrontation with Russia/Donbass. The situation would be easier to solve if the “Russian propaganda trope” of “Maidan did the sniper massacre” was just Russian propaganda, unfortunately, I would bet 2 monthly salaries on it being mostly true. Maidan simply needs to keep the war going to distract from this. Sounds a lot like the Nicolai Petro paper on rethinking Russia, which you also reviewed here. That’s how it is nowadays – Russophobes on one flank; uncritical Russophiles on the other; very few in the middle. Professor, it came to my attention that a radical group known as “Your comment is awaiting moderation Jihad” took my yesterday’s response to ErGalimba’s post and currently holds it in their Net-zindan. Apparetly, including links to both Ru- and Eng-language Wikidepia articles is a sign of haram to them. It’s not the first time this notorius group kidnaps comments. You have been rescued from the purgatory known as ‘spam filter’. Subhān Allāh! Not me – just my comment. A brief note, tangential to the “critics of Russophobia” not having access to mainstream media. In november of last year (2017) Guy Mettan became the target of pressures by Reporters Without Borders when he had the temerity of hosting the panel “They don’t care about us” on the “White Helmets true agenda” at the Swiss Press Club. The panelists included independent journalist Vanessa Beeley, harsh critic of the White Helmets and perhaps one of the people that made the greatest effort to shed some light into their financing and operating habits and procedures in Syria. Guy Mettan denounced pressures by reporters Without Borders to cancel the panel (documented in a letter that RSF sent him) and said that he was stunned that an organization that purports to defend press freedom was asking a journalist to censor a public discussion, instead of engaging with it (which he invited them to do). Mettan stood his ground and offered to host a second panel to offer the right of reply to the people that wanted to stand in defense of the White Helmets. So, while it’s true that critics of Russophobia or other “mainstream” perspectives on current geopolitical issues are not entirely prevented from accessing mainstream media, Mettan directly experimented pressures meant to push him to censor what a mainstream organization representing press freedom considered an “unorthodox” point of view (to the point of attacking Beeley personally and calling her a “so-called journalist”). The press reaction to journalists that place themselves (or end up) outside of what is considered the orthodox and prestigious media ensemble can be vicious.